Whole oats, good pasture and proper pellets help assure strong, healthy breeding stock. 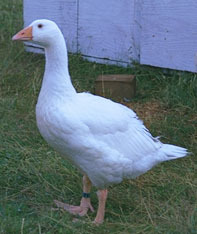 Today, it is generally only necessary for the breeder to be able to obtain two types of specialized feed and have access to one or two types of quality whole grains in order to provide an excellent diet for either ducks or geese. An excellent maintenance feed during all times of the year except the breeding season is a pelleted Duck Grower. Most types of Duck or waterfowl Grower contain appropriate amounts of trace minerals and vitamins for waterfowl and does not overdo the protein content which can lead to leg and wing problems for large types of ducks and geese and to coarseness and oversize in bantam ducks. The pelleted form is clearly preferable if it is available because each bite contains the proper proportions of ingredients and because there tends to be much less waste. Vitamin packages in any type of feed deteriorate quickly after the first two or three months after manufacture so pay close attention to expiration dates on bags and if in doubt, supplement with any of the quality brands of water soluble vitamin supplements. For a couple of weeks before and during the breeding season a breeder ration should be fed instead of grower pellets. This type of feed contains the correct formulation to stimulate fertility and insure that eggs produced have enough nutrient to sustain the duckling or gosling during incubation. Improper feeding before and during the breeding season (along with over-fattened breeding stock) probably contributes more to poor hatches than any other cause. If it is possible to permit breeders some access to good pasture on a regular basis and supplement the pellets for free choice whole oats, they will have what they need to produce a good crop of young. Hap py ducklings and goslings are the reward for assuring good nutrition for the parents. 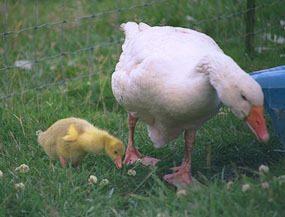 Once ducklings and goslings are out of the egg, they start their lives on a quality starter/grower ration. Such feed need not be made especially for waterfowl (although that would be nice) but it should no t contain medication. I usually switch my bantam ducks off starter/grower feed after thirty days and begin to introduce them to lower protein grower feed. After sixty days, the amount of grower pellets they get is limited to two feedings a day but they have unlimited access to whole oats during the entire growing cycle. If larger waterfowl have access to good pasture, such a feeding program will work vary well for them, too. Quickly growing young bodies demand proper nutrition. Breeding and show stock are maintained on the same feeding system I have just described for growing young birds insofar as they get limited access to the grower pellets and unlimited access to whole oats. Good pasture is just as beneficial to them as it is to breeders and young stock. Corn is fed in very limited quantities in the fall to finish out the birds for show and during only the most extreme cold of winter. Corn is quite fattening and is not as nutritious in my opinion as oats. I believe that the system described above can be followed anywhere in the country and that it will lead to success with breeding and growing out either ducks or geese. The actual brand of prepared feed is probably less important than the quality of the products turned out by the individual mill. I use Purina but I have heard both good and bad things about all major brands at one time or another. Do not hesitate to shop for another brand if results are not good with what you are using.